The iOS virtual assistant has learned to respond accurately to a variety of new instructions. You can now use Siri to get information about movies, sports, restaurant reviews, and reservations, in addition to testing its know-how regarding weather, stocks, and the like. You can also use Siri to post to Facebook and Twitter, launch apps, and get directions—and that’s all in addition to its ability to set timers, send messages, perform searches, and more. I now find myself using Siri throughout the day, for a wide variety of tasks and queries. Here's how one such day might go. Once I know how warmly to dress that day, I find out what kinds of clothes I should put on. The key factor is whether it’s a normal working-from-home day or a day when I might actually interact with other human beings. So I say, "Show me today." That instructs Siri to present a list of all the events on my calendar for the day. Armed with that intel, I’m off to shave and shower. Inevitably, at some point—often during the toothbrushing portion of my ablutions—I’ll remember something I forgot to do the night before. So I once again turn to Siri: "Remind me to put the DVD in the mailbox at 8 a.m."
It’s rare that a workday of mine gets under way without a reminder or two from the night before beeping on my Mac and iOS devices, something like “Write the Siri story”—almost undoubtedly a reminder I set via Siri. While colleagues formally schedule most of our office meetings in our shared calendaring system, someone occasionally sends out an email instead. Even though Fantastical is in my menu bar and Calendar sits patiently in my Dock, I often turn to Siri for help instead: "Put 'Call with Dan' on my calendar for 1 p.m. Pacific Time today." As I research stories throughout the day, I rely on Siri to place important phone calls, too. Sometimes I just say "Call" followed by the actual digits; if it’s a contact in my address book, I might instead say "Call Apple PR." Come lunchtime, if I'm cooking, I time it via Siri: "Set a timer for 12 minutes." (Note that Reminders works great with relative times, too; you can say "Remind me to check the oven in 12 minutes," if that’s more your style.) Sometimes, during lunch, I’ll think to call my sister in Israel. But since I never remember the time difference, I tend to ask my best friend: "Siri, what time is it in Jerusalem?" Thanks to iOS 6, I can use Siri to satisfy other burning questions at lunch now, too. "When do the Eagles play next?" 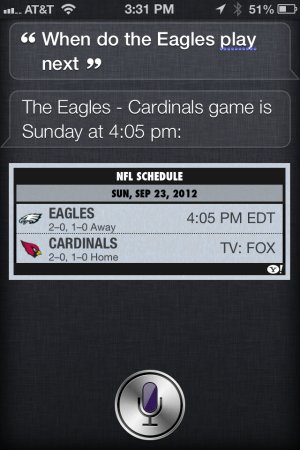 When Siri answers, I can then use it to compare the starting quarterbacks’ stats, by asking about each one in turn. I try to schedule any outside appointments for around the lunch hour, too. When I have one to attend, I rely on Siri to get me there. It’s impressively good at parsing addresses: "Give me directions to 1600 Pennsylvania Avenue in Washington, D.C." will get me to the White House. And I can always return home again with a simple "Take me home" request. If I’ll be back unexpectedly late, I can iMessage my coworkers with Siri, too: "iMessage Dan Moren that I’ll be back in another 20 minutes." New in iOS 6, Siri is much less strict about how precisely to phrase such instructions; it was far pickier in iOS 5, requiring more cue words. As dinner approaches, most nights, my wife tells me what she has cooked for that evening. 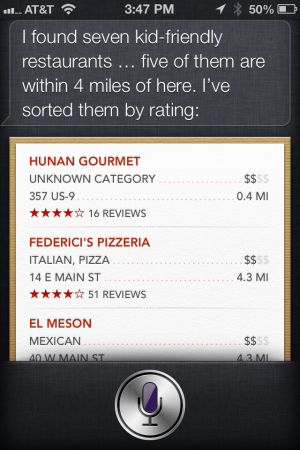 Sometimes she comes into my office and says: “We’re going out for dinner tonight.” That’s when I turn to Siri, which in iOS 6 lets you get amusingly specific: "What are the best kid-friendly Italian restaurants within 5 miles?" In central New Jersey, where I live, Siri knows plenty about some restaurants, little about others, and nothing at all about a few too many. If we lived somewhere more metropolitan, I probably could use Siri to make reservations, but out here very few restaurants support OpenTable. You can find some of your nearby options with a phrase like: "Where can I get a reservation for five people tonight at 6 p.m.?" 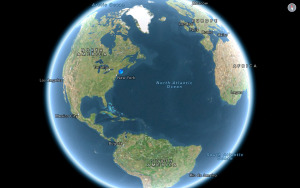 Siri will then gather what it can from Yelp; if that service covers your area well, you’ll be in relatively good shape. But if it doesn’t, Siri can’t compensate for that subpar data. Once the kids are asleep, my wife and I occasionally pick a movie to watch. Generally our choices are limited to what’s streaming on Netflix or HBO Go, but we let Siri help narrow our selections: "What’s a good comedy starring Jennifer Aniston?" More often, we use Siri to tell us whether a movie we're considering is worth watching: "Is the movie Rumor Has It any good?" I have three young kids, so I only very rarely see a movie in an actual theater. When I do, though, I can now rely on Siri’s knowledge of what’s playing (which, like its knowledge of who stars in which movies, comes from Rotten Tomatoes). As with Yelp, the quality of the data you get from such queries will depend on how well Rotten Tomatoes covers your area. 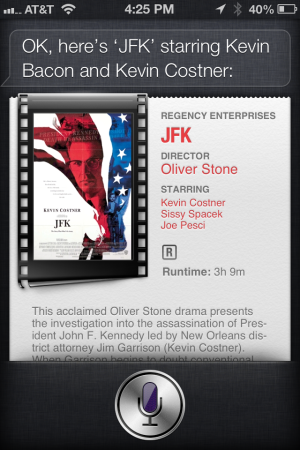 When I ask about movies playing near here, Siri performs beautifully. When a colleague in the San Francisco Bay Area asks for that information, Siri returns incomplete or erroneous data—more movies than the theater has screens, for example, or results for theaters too many miles away. When it’s finally time to retire for the evening, I don't use Siri to set an alarm for the next morning. I have kids for that. On those rare occasions when I need to wake up even before they do, or when I'm traveling, I turn to Siri one last time: "Wake me at 5:30 a.m."
I like launching apps with Siri, because it’s generally faster even than using Spotlight search. You can say "Launch Facebook," "Open Tweetbot," or "Play Angry Birds." If you want to open the camera, you can say "Take a picture," though that’s not necessarily faster than using the Camera lock-screen shortcut. If you tell Siri "Do not disturb," it understands that you’re alluding to the new feature in iOS 6 to mute alerts and notifications, but it can’t enable that feature for you: Instead, it will helpfully provide a link to that setting. Which is to admit that, as helpful as Siri is, I still have plenty of items on my Siri wish list that it hasn’t learned to handle. For example, you can’t use Siri to add or edit contacts, to go directly to specific websites, or to explicitly control third-party apps. And Siri still can’t toggle settings like Bluetooth. As mentioned above, Siri flails when you try to ask about athletes or movie stars with unusual names it can’t transcribe. And its information is generally only as good as its providers can offer. When Siri understands you on the first try, and when its answers are accurate, it’s awesome, and indistinguishable from magic. When it needs multiple tries to understand you, or when its answers are no good, Siri brings back unpleasant Newton memories. That said, with Siri’s gains in iOS 6—not to mention back-end improvements that seem to have Siri understanding me better than ever—it has become an even more indispensable way for me to interact with my iOS devices. Despite its occasional shortcomings, I’m grateful that it’s there.